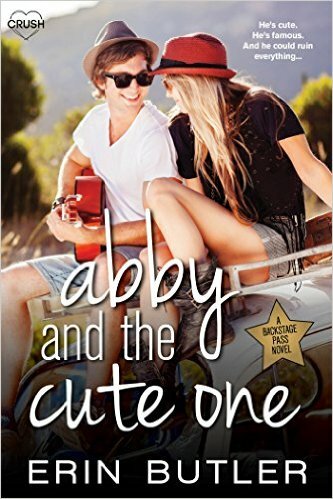 Happy Book Birthday: Abby and the Cute One (the 5th Backstage Pass book) by Erin Butler is out today!! Every member of Seconds to Juliet has a girlfriend-except for Nathan Strong. Now the band’s manager is leaning hard on “The Cute One” to play the role of the band’s heartthrob. With the band’s sales in decline, it’s up to Nathan to keep the fans’ fantasy alive. The plan is to stage a fake relationship and a fake breakup, and then let the fans fight to be the one to mend Nathan’s broken heart. Just one problem. There’s another girl in the picture-one Nathan can’t stay away from. In private, Nathan’s stealing kisses with the band’s new opening act, Abby Curtis. If they’re caught, no one wins. Abby will be fired, and the band might not recover the success they need to survive. But even with the pressure mounting, Nathan and Abby can’t stop themselves from stealing one more touch, one more kiss. And it’s only a matter of time before it all falls apart. This Entangled Teen Crush book is as forbidden as the secret romance it contains! It has hot kisses, graphic language, and extreme misbehaving. DO NOT GET CAUGHT WITH THIS BOOK…unless you want everyone to know you believe in true love.